What will be the longest-term damage of the Trump era? A strong, principled leader will restore some semblance of decency and ethics. Foreign governments might view this period as a bad dream, or an outlier event that veered the U.S. away from a now-returning normal. The anti-scientfiic and pro-industry biases in the various departments and agencies can be rectified just as quickly as they were enacted. There has been plenty of discussion of where the long-term damage might be on the world stage; the new path governments and businesses are taking toward China -- this might have been inevitable, and Trump has been nothing more than an accelerant; the move toward center stage of China and Germany as world leaders. But within the U.S. the long-term damage will be more subtle. It will be the loss of the oral tradition, of institutional memory, in our government. That is, the loss of processes and interactions that are conveyed by word of mouth and by example as opposed to by written instructions. The U.S. Treasury is a case in point. I worked there after the financial crisis, helping draft the Volcker Rule, setting up the risk management structure to get information up to the Financial Stability Oversight Council, and building an agent-based models to help assess financial instabilities. I just went back to the Treasury for the first time since the start of the year to find that is has been gutted. This is not something that is on many people's minds, but it has implications that will be felt far beyond the time that a new administration comes on the scene that wants to return the department to a more normal state. The reason, in a nutshell, is that what the Treasury does -- and what, for that matter the State Department, a department that is in even worse shape, does -- is not in any manuals. It is set on a foundation of what might be called oral tradition. People know how things work, how to get things done, and if the keepers of the oral tradition leave, it all has to start back up from scratch. When a new administration comes in, it is the normal course of business for all the appointees to be replaced. Generally the new appointees come from outside government, and have not had previous experience in the Treasury. They rely on the staff, which mostly stays from one administration to the next. They know the process for getting things done, for developing and administering policy. 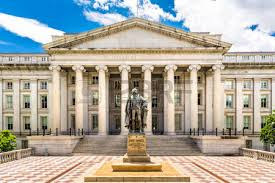 The Treasury is not a regulator per se, but it tends to be the center of communication -- and the referee when necessary -- for the agencies that do have regulatory authority: the SEC, FDIC, CFTC, etc. There is a process that has been honed over many administrations for doing this job, for acting as the central switchboard for dealing with financial issues. What happens when the switchboard operators walk out the door, and there is no operation manual to leave behind?